The Baekdu Daegan (White head – Great ridge) is an unbroken ridgeline that stretches over the entire length of the Korean peninsula. In South Korea it starts at Jiri-san (exquisite-wisdom mountain), and is intersected some 650 walking km later north at the De-Militarized Zone (DMZ) seperating North and South Korea. The ridge continues through North Korea to its end at Baekdu-san (White Head mountain), on the North Korean/Chinese border. The trail holds remarkable splendor in its beauty, cultural and historical significance. Its physical and spiritual presence is conceptualized by religious and sacred followers. It self-commands nationalistic reverence by all inhabitants of the Korean peninsula and is the provider of essential life-energy and source of all waterways on the peninsula, testament to that is that the trail never crosses a waterway. The Baekdu-daegan has potential in being recognized as one of the great international hiking trails as acknowledged by the South Korean government with recent discussion angled towards the preservation and promotion of the trail as a national or world heritage site. Join us on this walk back through the past and into the future as we rediscover the immense culture and history of this grand land through the path of the Baekdu – daegan. Photo: In this image the Baekdu-daegan follows the tigers spine. Baekdu-san is the nose and Jirisan is near the hip. 백두대간은 한반도 전체에 걸쳐 중단 없이 길게 뻗어 있는 산맥이다. 남한의 지리산에서부터 산행길로 650km쯤 북으로 가면 남북한을 갈라놓은 DMZ와 교차하게 된다. 산맥은 북한을 관통하며 계속 북으로 뻗어 북한과 중국의 국경지대인 백두산에서 끝이 난다. 산행길은 아름다움 속에 웅장한 경관들이 있고, 문화와 역사적인 중요성도 함께 안고 있다. 그래서 신앙적이고 신성한 추종자들은 (이런 요소를) 물질적이고 영적인 존재로 만들어가고 있다. 그런 것들이 한반도에 사는 모든 국민들이 민족과 국가에 대한 경외감을 가지게 만든다. 또한 백두대간은 본질적인 삶의 에너지원을 공급해 주고 한반도의 모든 강과 내의 원천이 되고 있다 다시 말하면 산행길은 어떤 강이나 내도 가로질러 갈 필요가 없다는 뜻이다. 백두대간은 한국정부가 인정하는 훌륭한 국제적인 산행길로 승인받을 가능성이 커져가고 있다. 최근에는 정부에서 국가 또는 세계유산으로서 산행길을 보호,장려하는 방향으로 적극 검토하고 있다. 과거에서 미래로 나아가는 우리들의 이번 백두대간 산행에 동참하여 위대한 이 땅의 소중한 문화와 역사를 되새겨 보지 않으시겠습니까? Wow! Its great to see people doing exciting things here in Korea. I look forward to following your progress. Good Luck from here in Gwangju. Good luck guys! It's about time this great walk got some recognition outside Korea. I've been serving in the US military for 3 years in Korea. We've lead numerous expeditions for charity on this trail. As amazing as it was, our experience would have been enhanced by a guidebook like yours. Go for it! -Thanks a lot for your support, we hope you continue to follow our progress along the way. A question - do the US military have detailed topographical maps printed in English here? We will be using Korean maps, which we prefer for our walk but we will need English maps for our publication, which seem hard to find. We've always had a couple of Korean soldiers leading us, who have done the walk many times before. They used their own maps. Great route finders, but they couldn't speak much English. That's why your book would've been useful. I only work as an MP, so I don't know much about what we carry in the way of maps. I presume we have most things covered. Whether the US military is prepared to relase such material, I just don't know. 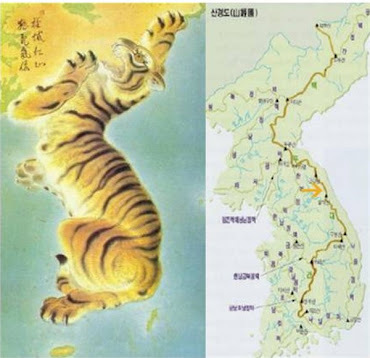 The baekdudaegan trail follows the line marked with our end point at Jinbu-ryeong located at the orange arrow just short of the DMZ. 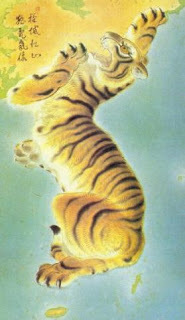 The Tiger is the animistic image of the Baekdu-daegan with its spine representing the ridge. The logo represents the green piercing hills and mountains of the Baekdu Daegan and the blue cascading waters it generates. It is epitomized with a ‘koru’ a New Zealand Maori artwork that represents ‘new life’. 되어 떨어지면서 일으키는 파란빛을 상징한다. 것인데 ’코루‘란 ‘새로운 삶’을 상징한다. The Baekdu-daegan ridge stretches the length of the Korean peninsula and includes most of its highest peaks. It holds great nationalistic and sacred importance for the Korean people as the provider of life-energy sources and water for the peninsula. It has been revered by native Koreans since the birth of Koreas mythological leader in 2300BC, and it is said to walk its spine empowers individuals with the spirit of the peninsula. Follow us as we discover its beauty, culture and history. The walk will begin on September 1st 2007 and is planned to take 70 days. 백두대간을 따라서 다시 과거로의 그리고 미래로의 탐험에 여러분을 초대합니다. 백두대간은 한반도에 길게 뻗어져 있습니다. 백두대간은 한국인들에게 매우 국가적이며 신성한 중요성을 가지고 있습니다. 또한 한반도에는 삶의 에너지원과 수원을 제공해 줍니다. 백두대간의 아름다움과 문화, 역사를 찾아 떠나는 우리의 일정과 함께 하지 않으시겠습니까? 우리의 일정은 2007년 9월 1일에 시작해서 70일간 계속됩니다. The translation team - gotta love these guys! Old teaching buddies Sung Byung-oh a retired Professor of Korean Literature from Busan Womens College and now successful novelist and Jeong Kyoo-hwan a retired High School teacher and loyal friend also from Busan. Roger Shepherd - Field Researcher, Andrew Douch - Field Researcher, Prof. David Mason - Academic Researcher, Shawn Morrissey - Assistant Researcher SUPPORT CREW - David Sargeant (Jinbu), Mike Allbee(Daegu). Start date - 01 Septmeber 2007. End date - 09 November 2007. Mission. To collect hiking data on the Baekdu- daegan to forward reference into an educational and cultural guide on the Baekdu daegan hiking trail. 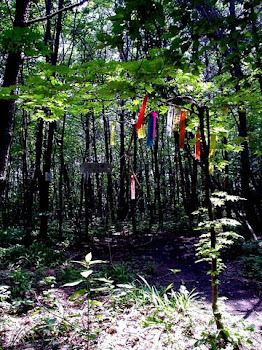 Also known as the ribbon trail the Baekdu Daegan is frequently emblazoned with (tags) or ribbons indicating the conquests of previous trail parties. We will also be blazing our trail with a ribbon. Keep an eye out for it.